Units range from standard studios to luxurious 1-bedroom spa bath units, plus 2-bedroom family suites, fully self-contained. All have Sky TV and high-speed wireless internet access. Laptop for hire and internet kiosk. King and queen-size beds. Relax around the private swimming pool or wander into the town centre and sample the many restaurants and cafes. Super king beds - ensuite with bath - kitchenette - suitable for corporate and tourists - Extra person on rollaway $20. No Smoking, Cooking Facilities, Twin Bed, Austar/Foxtel, TV, Radio, Iron/Ironing Board, Bath, Shower, Microwave, Tea/Coffee Making, Hairdryer. Fully self contained with super king bed in bedroom and a single in the lounge. Rate is for 1 - 2 persons, extra persons incur tariffs of $20. No Smoking, Disabled Access, Cooking Facilities, Twin Bed, Single Bed, Austar/Foxtel, TV, Radio, Iron/Ironing Board, Shower, Microwave, Oven, Tea/Coffee Making, Hairdryer. Studio with queen and a single bed. Kitchenette, ensuite with bath. Maximum persons 3. Rate is for 2 persons and extra person $20. No Smoking, Cooking Facilities, King Bed, Single Bed, Austar/Foxtel, TV, Radio, Iron/Ironing Board, Bath, Shower, Microwave, Tea/Coffee Making, Hairdryer. Spacious suite with double spa bath, kitchen, queen bed, 2 single beds in lounge and bed settee. Rates for 2 persons - extra persons $20. 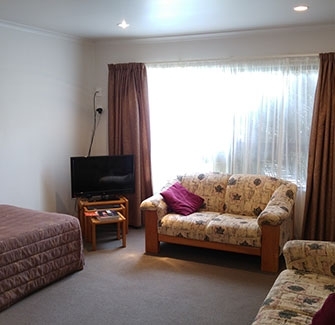 No Smoking, Cooking Facilities, Spa Bath/Pool, King Bed, Queen Bed, Austar/Foxtel, TV, Radio, Iron/Ironing Board, Shower, Microwave, Tea/Coffee Making, Hairdryer. Studio with 2 single beds. Kitchenette, ensuite with shower. Pool side. 1 - 2 persons. No Smoking, Cooking Facilities, Queen Bed, Austar/Foxtel, TV, Radio, Iron/Ironing Board, Shower, Microwave, Tea/Coffee Making, Hairdryer. A spacious apartment with a queen bed in 1 bedroom, 2 singles in the other and 2 singles and 2 bed settees in the lounge. Full kitchen with dishwasher. Private patio and deck to pool. Parking at door. Up to 4 persons, $20 for each extra person. 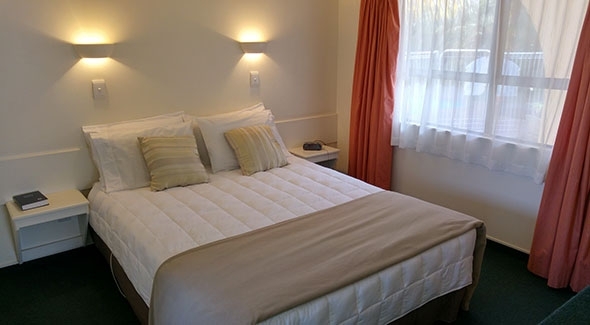 No Smoking, Cooking Facilities, King Bed, Queen Bed, Single Bed, Austar/Foxtel, TV, Radio, Iron/Ironing Board, Bath, Shower, Microwave, Oven, Tea/Coffee Making, Hairdryer.